Spectacular Oceanfront condos with great views from this 2 BR 2 BA Hampton Place condo in Palmetto Dunes. See the Atlantic Ocean directly from the kitchen, living room and both bedrooms, views are everywhere. See the moon and sun rise over the ocean. Look over the Hampton Place pool and out to the Atlantic ocean where dolphins and pelicans play. Only seconds to world famous beaches on Hilton Head and only minutes to golf courses, tennis courts, restaurants and bars in Palmetto Dunes. Many Hampton Place condos have trees blocking there view, but this condo has a totally unobstructed view of the Atlantic Ocean!! Pool is heated in the spring from mid March to the end of April and mid October to end of November. Two community pools with kiddie pool and hot tub to enjoy. The 2 BR condo has a kitchen completely ready with all the comforts of home, coffee maker, blenders, pots, pans, stove, refrigerator, glasses and dishes. You can create gourmet meals or afternoon snacks. Enjoy the covered private veranda and hear the ocean waves all day long. The master bedroom has king size bed, private en suite full bath with glass enclosed shower, tub and LCD TV is in the bedroom. Guest room has 2 twin beds with LCD TV and access to full bath. Living room has fold out couch for guests. Sleeping capacity is six people. Dining room table seats six people for a great meal together to share your daily stories on vacation. Free wifi included and DVDs to enjoy movies. Golf Package is available for this condo. Check with us for discounted rates. Palmetto Dunes offers a shuttle to run you to the golf courses, tennis courts and to shop in Shelter Cove. Leave the car parked and roam the resort. Palmetto Dunes offers three golf courses, tennis courts, miles of bike paths, Marriott Oceanfront Resort and Omni for restaurants and bars. Walk right out to the 17 miles of white sandy beaches for a sun tan and splashing in the waves. Hilton Head has 30 golf courses within 20 minutes of Palmetto Dunes, over 112 miles of bike paths, 400 tennis courts, 200 restaurants and over 250 shops. 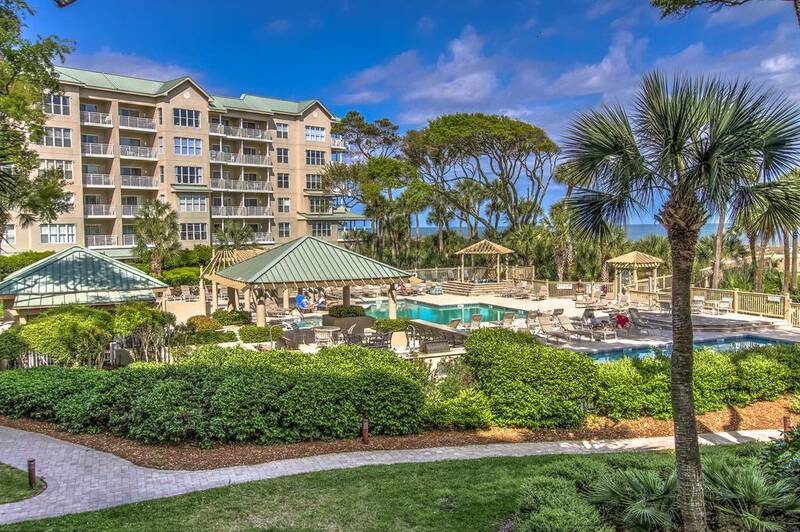 Hilton Head Island is a great vacation location and this 2 BR Hampton Place condo in Palmetto Dunes is a spectacular place to stay. Welcome to Hilton Head! This entry was posted on 02/03/2016 by .